As I wandered into the Washtenaw County MSU Extension office on Zeeb Road last week I saw multiple notices advertising a free family event titled, Breakfast on the Farm. Curious to learn more, I spoke to Nancy Thelen, director of the Washtenaw County MSU Extension Program. Her office and the Washtenaw County Farm Bureau organize the event. Hosted by the Horning Family, recently honored by the Washtenaw County Commissioners for their work as “progressive dairy producers,â€ and named the MSU Dairy Farmer of the Year, the breakfast will take place from 9 a.m. to 1 p.m. on June 26 on their farm in Manchester.According to Nancy Thelen, the Horning family volunteered to host the breakfast on their 700-acre farm. “They are just the type of family that realize promotion and marketing is another very important part of being a dairy farmer,â€ explains Thelen, when I exclaim at their generosity. “It is so important because so many people don’t know where their food comes from and you hear bad things. This is really an opportunity for us to say that your food is produced locally and this is what a dairy farmer does. So we are excited, we are excited about this.â€ Thelen’s enthusiasm is contagious. Huge success indeed, last year Clinton County printed 3,000 free breakfast tickets and “they served breakfast to 1,200 people and they had about another 300 come that went through the tour,â€ explains Thelen. This year Washtenaw County is printing 4,000 tickets and is hopeful 1,500-1,800 people will join in the festivities. 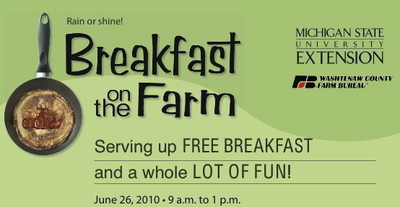 There is no cost to attend the event or take a tour of the farm, but tickets are required for the free breakfast. Free tickets are available all over Ann Arbor: Downtown Home & Garden, Washtenaw County Farm Bureau, Washtenaw County MSU Extension Office, and Washtenaw Dairy. For a full list of ticket locations, check out their website or call the MSU Extension Office at 734-997-1678. I interrupted Thelen’s proofreading of the site plan for the educational stations and was able to sneak a peek at what is in store for June 26. In addition to hay rides from the parking area, visitors will be able to tour through a calf rearing educational station, the milking parlor (with the cows being milked at one point during the morning), a manure recycling station, a conservation station, a cropping station (manned by the MSU Extension Agricultural expert), and even an area to talk to veterinarians about cow maternity and biology. One final enticement, Domino’s pizza sources their cheese from a cooperative of Michigan Dairy Farmers of which Hornings is one. Dominos will be providing the food and will be unveiling their much anticipated, “Breakfast Pizza,â€ which up to now has only been sampled in school meal programs. Agriculture brings in $71 billion a year into the Michigan economy. Dairy is a huge contributor to those many zeros. Come to Breakfast on the Farm and learn more about our amazing local food wealth!